5. 2. 2014 | Researchers from Munich's Technical University TUM have discovered how organic carbon is stored in soil: carbon only binds to certain soil structures. Therefore the soil's capacity to absorb CO2 needs to be re-assessed. Global carbon dioxide emissions continue to rise – in 2012 alone, 35.7 billion tons of this greenhouse gas entered the atmosphere. Some CO2 is absorbed by the oceans, plants and soil. Hence they provide a significant reservoir of carbon, curbing the release of CO2. Previous studies have established that carbon binds to tiny mineral particles in the soil. With their new study, researchers from the TU Munich and from the Helmholtz Zentrum München (German Research Center for Environmental Health) have shown that the surfaces of these minerals are just as important as their size. "The carbon binds to minerals that are just a few thousandths of a millimeter in size – and it accumulates there almost exclusively on rough and angular surfaces", Prof. Ingrid Kögel-Knabner explains, TUM chair of soil science. The theory is that the rough mineral surfaces provide an attractive habitat for microbes. These are able to convert carbon and help binding it to the minerals. "We discovered veritable hot spots with a high proportion of carbon in the soil", says Cordula Vogel, the lead author of the study. "Furthermore, new carbon binds to areas which already have a high carbon content." These carbon hot spots are, however, only found on about 20 percent of the mineral surfaces. Previously, it was assumed that carbon is evenly distributed in the soil. "Thanks to our study, we can now pin-point the soil that is especially good for sequestering CO2", Kögel-Knabner continues. "The next step is to include these findings in carbon cycle models." The sample material used by the team was loess, a fertile agricultural soil found in all parts of the world – making it a very important carbon store. The researchers were able to take ultra-precise measurements using the NanoSIMS mass spectrometer. This instrument allowed them to view and compare even the most minute soil structures. 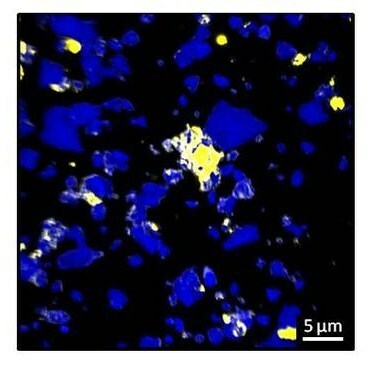 Carbon binds | to specific rough mineral surfaces known as hot spots (yellow areas).